illus. by Gareth Hinds. 272p. bibliog. maps. notes. Candlewick. Mar. 2019. Tr $27.99. ISBN 9780763681135; pap. $16.99. ISBN 9780763696634. 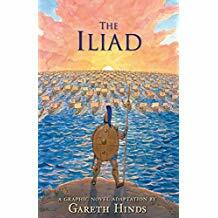 Gr 7 Up—Hinds, who has adapted numerous classics into comics format, brings the Greek epic to life with this full-color graphic novel. Beginning with an illustrated cast of characters and concluding with extensive back matter consisting of maps, page-by-page notes, a bibliography, and an author's note, this version will strike a chord with newcomers and those familiar with the source material alike. The story begins by invoking the Muse to sing about Achilles's anger toward King Agamemnon in the 10th year of the Trojan War. The Achaeans seek treasure from Troy and wish to bring back Menelaus's wife, Helen, whom Paris, prince of Troy, seduced with the help of Aphrodite. Hinds seamlessly transitions from close-ups to battle scenes, from emotional streams of dialogue to wide angles of scenery, effectively establishing setting. Dialogue-heavy panels are well integrated, and the gods make grand and dramatic appearances. Names of characters who were killed in battle are listed. Battle scenes are graphic though not gratuitous, fitting with the message about the consequences of war. VERDICT A well-researched and successful adaptation; recommended for most public and high school library collections.